Chinese influence in the South Pacific is growing. Through ‘debt-trap diplomacy’, Beijing is extending a spur off its Maritime Silk Road that runs across the South China Sea and into Papua New Guinea and the chain of South Pacific countries. 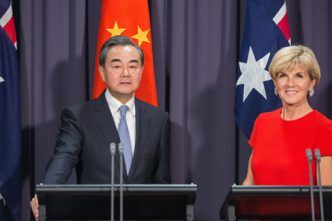 Beijing’s attempted move into our region generates highly undesirable strategic outcomes for Australia. Chinese investment under the Belt and Road Initiative is not without hefty strings attached. It’s not ‘win–win’ for China and the recipient, but simply ‘win’ for China, which not only gets access to local resources and new markets, and forward presence, but can coerce the recipient state to pay a ‘tribute’ to Beijing by ceding local assets when it can’t pay back its debts. Look to Hambantota in Sri Lanka for what happens next. Chinese-owned ports and airports could eventually facilitate a forward presence for the PLA Navy and Air Force in the maritime and air approaches to Australia’s eastern seaboard. That would fundamentally change our strategic circumstances for the worse as key population centres would come under direct threat in wartime. The prospect of a Chinese-developed port on Manus Island, along with possible Chinese development of Wewak, Kikori and Vanimo harbours in PNG, has generated concern in Canberra. A Chinese-controlled port on Manus would give Beijing a prime strategic location for projecting military power north towards US forces in Guam or south towards Australia. That could include anti-submarine sensor networks to make it more difficult for Australian and US submarines to operate in the Western Pacific. It would also strengthen China’s ability to project influence into the South Pacific, complementing any future PLAN presence in Vanuatu that is likely to be centred on the port at Luganville in Espiritu Santu. A Chinese base on Manus would ensure the PLAN could use anti-access and area denial (A2AD) capabilities as part of counter-intervention operations against the US Navy and Air Force. In a 21st-century geopolitical game of Weiqi, it’s a logical move by China to outflank and encircle the US and its allies. 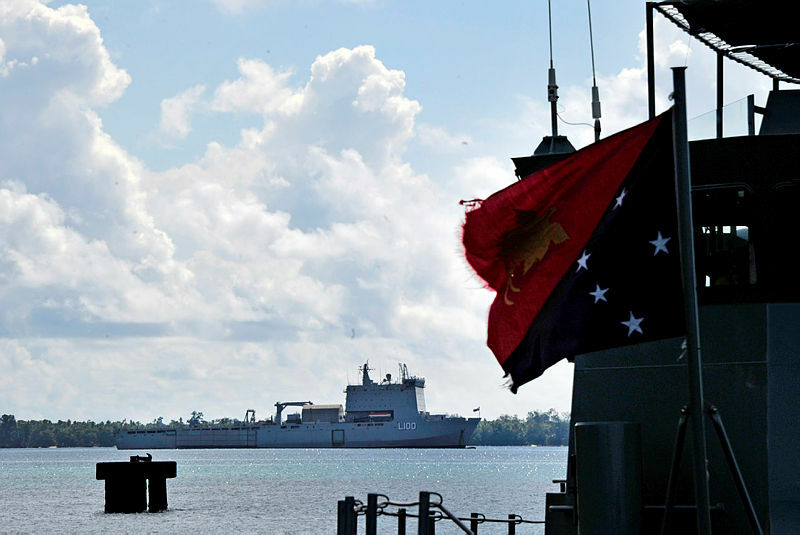 So an agreement to establish a joint Australia–PNG naval base on Manus before China can pressure the PNG government with an ‘offer they cannot refuse’ is a smart move. (Xi Jinping has invited Pacific islands leaders to a meeting in Port Moresby before the APEC summit in November). 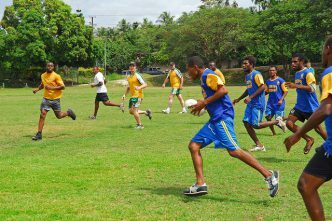 Australia and PNG should move swiftly to cement the deal. The RAN, as well as the US Navy, needs to have a visible presence on Manus during the Chinese-run forum. If that happens, Xi’s game of Weiqi will have suffered a setback—though, to mix my metaphors, it wouldn’t be checkmate: the game would continue. ASPI’s Anthony Bergin notes that a RAN and USN presence on Manus would assist the PNG Defence Force in strengthening regional maritime security and allow it to ‘gain experience in operating more closely with Australian and US naval and air surveillance forces’. He notes that the Lombrum facility on Manus has established infrastructure, which could be swiftly converted for operational support of naval forces. He also makes the valid point that a logical complement to any naval base at Lombrum would be to secure basing rights for USN, USAF and RAAF aircraft at Momote airfield near the Lombrum naval facility. The airfield is capable of accommodating Boeing 737-type aircraft and, with development, could support RAAF and USN P-8 Poseidon maritime patrol and response aircraft, as well as Triton UAVs. The base would also be able to support fighters like the F-35, or longer-range bombers. 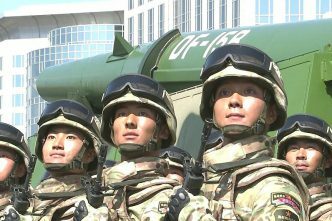 Such air power could constrain China’s ability to project force into the middle seas and out to the second island chain, limiting its ability to exploit A2AD in any future crisis over Taiwan or in the South China Sea. This deal shouldn’t be purely about military posturing. Greater investment in PNG’s economy and security should follow to boost economic growth in a way that directly benets the PNG people. That’s very different from China’s debt-trap diplomacy, which is designed to give China access to resources and a presence in an area. 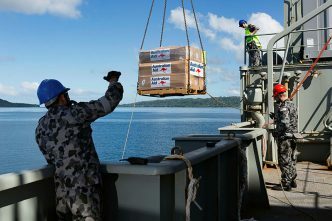 A combined defence and foreign aid strategy would weaken China’s influence in the South Pacific and ensure that countries in the region understand that they don’t have to buy into the BRI, with all its attached political and strategic strings, to secure their future development. But Australia has to get serious about having an effective foreign aid policy for the South Pacific if this strategy is to work. 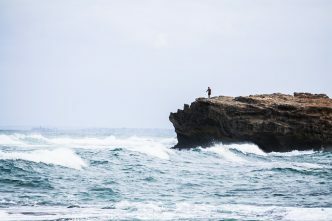 Australia and the US have to move quickly and concomitantly to counter an increasingly confident China that seeks to assert its influence and presence across the South Pacific. The consequences of failing to respond would be dire. Chinese ambitions don’t end at the reunification of Taiwan and China on Beijing’s terms or control of the South China Sea. China is clearly emerging as a hegemonic power, exploiting both soft-power inducements and hard-power threats to reassert itself as a new middle kingdom, and overturning what it sees to be a century of humiliation. Part of the ‘China Dream’ is ensuring that its periphery is secure through a belt of vassal states that accede to Beijing’s interests. The view from Beijing suggests that an extension of the BRI into the South Pacific makes geostrategic sense if the Chinese goal is to win strategic competition against the US as part of that China Dream. The view from Canberra should be to blunt such a move or risk seeing Australia increasingly isolated in a ‘Sinosphere’ dominated by Beijing. The view from Washington and Honolulu should be to work with Australia and other allies to counterbalance and limit China’s expanding influence across the Indo-Pacific, including in the South Pacific. Going forward to Manus makes eminent geostrategic sense as part of this strategy.